SAN DIEGO, Calif. -- Nola, an endangered female white rhinoceros, died Sunday at the San Diego Zoo. The San Diego Zoo Global Wildlife Conservancy tweeted out the sad news around 11 a.m. The zoo had not released information on a cause of death. The 41-year-old rhino had recovered from a surgery where veterinarians removed an abscess on her hip in January. For more than a week she was monitored closely by zoo staff until her health had improved. Only three northern white rhinos remain in captivity, the zoo said, and most of those rhinos are too old to reproduce. All wild northern white rhinos became extinct in 2008 due to increased horn poaching. 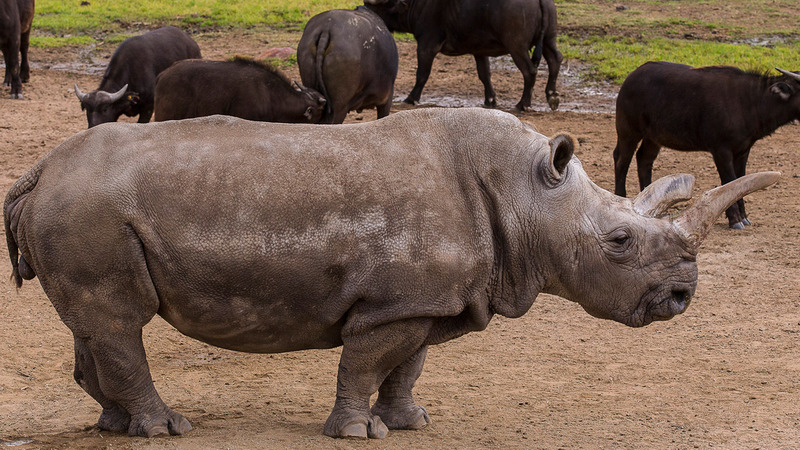 In December last year, Nola's 44-year-old companion Angalifu died, and in July, a female white rhino died at the Dvur Kravole Zoo in the Czech Republic. Earlier this month, half a dozen female southern white rhinos between the ages of 4 and 7 were brought from South Africa to the zoo in an effort to save the species' northern cousins. The San Diego Zoo Institute for Conservation and Research hopes to develop embryos from frozen northern white rhino cells and use the southern white rhinos as surrogates. Genetic material from a dozen northern white rhinos has been preserved at the conservation center for reproductive opportunities. The northern white rhino is a subspecies of the white rhino, which is the second largest animal on land, according to the World Wildlife Fund for nature.